Co-ordination with your feet is just as important as having good hand-eye co-ordination. To be able to make quick saves with your feet and when on the move, you need to have good reactions from your feet; able to track the ball into your feet. Like hand-eye co-ordination, you need to work hard on co-ordinating your feet for those reflex saves. In field hockey, where our feet play an important part in distributing the ball, and making the actual saves, you should be aware of the need to have sufficient skills in this area. Other than saves, our feet are also essential for kicking the ball in clearances; seeing the ball into your feet and legs is a key to goalkeeping, since that is where the majority of low shots are saved, and this seems to somewhat overlooked in our sport. It should therefore be your mission to have just as sufficient co-ordination with our feet as we do with our hands. For making saves with the feet, like this split save stretching out, you need to be able to track the ball into your foot to stop the shot successfully. Soccer (football) is very good for practising your foot skills. The ball skills they do are great for hockey goalkeepers; getting the feet active and moving around to connect with the ball. As your eye has to be on the ball to track the ball into your feet and make connection for the save or kick, then you will be working on your foot-eye co-ordination. Although it takes a bit of skill and practise, getting used to having the ball at your feet should be useful in feeling comfortable kicking the ball, as well as improving your reactions when saving with your kickers. The soccer trick that everyone knows: kicking the ball up into the air, and then keeping it up there, by continuously knocking it back up, is a great way of establishing eye connection with your feet. All you need to do is basically kick a soccer ball into the air and see how many times you can kick it up without it ending up dropping to the floor. This can easily be done at home, in your back garden, or down a park. Bending at the hip to lean forward will help with your technique. It is also possible to do this in your pads; kicking a hockey ball up in the air with your kickers. You can do this before a match or have a go doing it at training. The principle is the same: you need to keep the ball up in the air by continuously kicking it up. As well as working your eye contact, it also gets your feet moving. Kicking a soccer ball against a brick wall is a great way to practise your lower body reflexes. Kick the ball against the wall and then try to control the rebound back off the wall. The speed of the redirected ball will be harder to control, making it a good drill for practising foot reflexes. Volleying a soccer ball is another great way of practising ball skills, and working on your foot-eye co-ordination. Volleying is when you kick the ball up in the air and then shoot as it comes back down. When you volley the ball you will have to follow through with your vision, focusing on the ball as you connect with foot. Doing this against a wall is the best idea; the rebound sent out you can volley back again. Knocking a soccer ball around amongst friends is a simple way of practising your kicking skills; passing the ball between you and another (or multiple) players at varying speeds and distances. This will help you practise your ball skills; working on your ability to kick the ball and watch to see when a pass is coming to you. To make things harder and get more practise, you can change the type of ball you use. Soccer balls come in different sizes, so you can get a smaller sized ball to make it harder for yourself. Tennis balls are also a good idea; as they are much smaller, they are more difficult to kick. Whilst shot stopping is an essential part of the goalkeeping role, there is more to it than just that! Goalkeepers can often be quiet personalities (that’s not to say there aren’t eccentric or outward going members of the goalies’ union i.e. Bryzgalov of the Philadelphia Flyers; wrong sport but a good example!) and as such, can often be content with simply reacting to the game as it develops rather than orchestrating their defence. However, by organising the defence, the goalkeeper can quickly identify areas of attack, helping their team to play to a higher level. By taking command of their team and relaying instructions or pointing out unseen attackers who have managed to get in front of them (for example! ), they show they are confident in their ability to read the game and take charge of the situation. Whilst it’s difficult to show being vocal through pictures, here is James Fair watching the game and instructing his team. The goalkeeper arguably has the best view on the pitch. They can observe the game as it unfolds, reading the play to work out potential dangers and points of attack that could lead to scoring opportunities. With this significant advantage, the goalkeeper can use it to help their team out, identifying these dangers and telling them of them. If you were playing in defence, wouldn’t you want someone helping you out with advice on where the dangers are?! The more you help your team out, the more confident they will be with you in goal, knowing they can trust you to provide them with the support they need. Engaging in dialogue with their defence lets them know they are being helped. Reading the play is an elite skill that helps you respond to changes in the game but needs analysing in more detail (so hopefully I’ll get round to writing an article on that at some point!). It is more obvious for a field player when making interceptions during a break in play, but for a goalkeeper, they need to be aware of all that’s going on in front of them. Watching games in person or video footage of games will help you learn to read the game as it happens in front of your eyes. Reading the play and being constantly aware of goal scoring opportunities will help you in being vocal; knowing what to say and when. The case of the silent goalkeeper is one that goalkeepers shouldn’t aspire to, but is a fairly common occurrence! For all their technical ability at stopping shots, their inability to be a commanding presence for their team hampers their chances of greater success. Whilst trying to tally up your success rate against a lot of shots, a better goalkeeper is one who looks to limit scoring opportunities by constantly feeding their team information. A silent goalie is more likely to face more shots and scoring opportunities because they are not commanding the game in front of them. A game involves team effort and by barking out orders, you are showing that you want to be part of the team and want to help them out. Being involved in the game also helps with concentration. With this maintenance of your concentration levels, you stand a better chance of making the save when it matters. By being in tune with the game and not dropping off to sleep (which is an extreme but makes the point!) will also help you stay sharp and be able to make the save when an opportunity on goal occurs. The best weapon (if that’s a suitable phrase!) against the attacks of the opponents, is actually your voice. Aside from pointing by gesticulation (i.e. waving your stick in the direction of free attackers), the best chance you have of communicating with your team is obviously to talk to them. Watching international goalkeepers in action will show you the use and importance of the skill of being in dialogue with your team. James Fair (GB and England international) is a good example of a goalkeeper who creates a dominant presence with his voice, constantly barking out instructions to his team as he identifies goal scoring opportunities early on and tells his defence about them. In the heat of playing a game and being on edge and nervous, it can be easy to forget the need to be vocal. When I was being coached as a deputy to an elite level goalkeeper, I was told that your defence often want to simply hear the sound of your voice so they know you are still there! Whilst you don’t want to slip into the trap of providing useless information, you still need to be constantly barking out orders as and when you see a breakdown in defence. The more involved you are, the more your defence and team can structure themselves towards each occurring threat. It’s difficult to be heard during a game, but you need to work on it and stick it out to help you develop your goalkeeping skills. The phrase “be heard by the other goalkeeper” is often used in coaching terms when describing the need to be loud. Essentially you need to be as loud as you can, potentially being heard from the other side of the pitch! Practise helps and learning to shout and raise your voice will obviously help (but be careful where you do it!). When I was learning the importance of shouting, I had to be heard over aeroplanes (with the pitch near an airport obviously!)! Ultimately, whilst it’s not always easy, the goalkeeper has to take it upon themselves to command their team. Shot stopping abilities only get you so far. The more you engage with the game, the more you show your team you are able to read the game and provide them with useful pointers to threats they need to deal with. By being a vocal presence, you will see an improvement in your concentration and the way you can reduce scoring opportunities. Author Dan PilgrimPosted on July 16, 2012 August 13, 2014 Categories Dan's TipsTags Defensive tactics4 Comments on Marshal your defence! Playing to a consistent level is a major part of goalkeeping. Learning how to provide your team with a standard of shot stopping ability they can trust and are confident with becomes the backbone for success. Without it, how do you expect to have a good run during a season? It’s all well and good playing a “blinder” but if you can’t repeat the success next game, what good is it? Coaches are more inclined to pick a goalkeeper who is shown to be consistent and can continue that consistency at a higher level. This is true whether it is at club level or international: if you play well and stop the ball and are giving your team the best chance of winning, then you are more likely to get picked! When playing for a long stretch of games, you obviously want to be putting in good performances on a regular basis. Not only is it going to help you win a league or tournament, but will show your team and coaching staff that you have what it takes and provide good goalkeeping at critical times no matter the occasion. The better you play, the better your team plays. A team who can trust their goalkeeper to make the timely saves is theoretically more confident going forward, since they have less to worry about being scored on and therefore will increase their scoring chances. By playing confidently and having confidence in your team, everybody wins! Whereas in American sports they are inclined to track save percentages and goals allowed for each and every goalie performance, it seems harder to analyse how well a goalkeeper performs over a longer period of time. You could always work out the stats for yourself to find a good average; working out a medium level that you can work to improve from. Obviously the more wins you record the better, but by tracking down a base level of shots stopped or games won or goals allowed, you can work on improving your . Other factors like the quality of your defence and your experience (which helps with decision making and playing confidently) will come into play, but at the end of the day, the more shots you stop, the more you give your team the chance of winning on a regular basis. Playing consistently is all down to a good ‘mental game’ (which is a very big topic and will hopefully be looked at in more detail in other articles). Learning to play well at away pitches and overcome difficulties that affect your psychological mindset will set you up well for being able to play consistently whatever the game. The more confident you are, the better you will play over an extended period of games. The trick to playing with consistency is to play your best and give it your all. Even if you lose, you want to make sure you only lost by a goal or two. Heavy defeats are going to affect your analysis of your ability to perform well, whilst going from play really well to playing poorly are not going to look good either. The ability to play consistently also comes down to experience. Whilst young goalkeepers can show a lot of talent early on, the more games you have and played and the more experience you have under your belt, is a decisive factor in your ability to turn out a good performance regularly. Unlike outfield players, goalkeepers don’t reach their playing peak until late into their twenties or early thirties, so “earning your colours” will eventually help you turn out strong seasons. A consistent goalkeeper is one who plays well no matter what. In spite of how well the team performs, the goalkeeper plays well. Consistency is shown by the goalkeeper’s ability to provide their team with the chance to win in good games and bad. If you take a look at the elite goalies in pro sport, you’ll notice the quality of the better performing goalkeepers. Not only do elite goalies steal their team wins but they play well throughout the season, not going through bad patches that cost their team points. Brad Friedel, for example, (even though he is in the twilight of his career) is a very good unsung goalkeeper who provides consistency for his team and has done for a number of teams over a number of seasons. Ultimately, you need to try and be consistent in each and every game over your each year’s season and also your entire playing career! Setting yourself a goals against target or number of wins a season can be a way of working towards self improvement and consistency. The key to consistency is simple. Play every game the same; have the same attitude no matter if you think they’re ‘easy wins’ or difficult games and you will find yourself performing at a good standard throughout the season. Whilst it sounds harsh, it’s no good going through the motions and being happy with poor performances. So you may not want to play competitive or high level hockey (that’s not to say you can’t be competitive at lower levels; a game is what you make it!) because you feel it’s not your thing, but that doesn’t stop looking to improve yourself and be the best goalkeeper you can be. If you can bothered to turn up to every training session and play through rain and snow, then why not be bothered to look to improve your technique and overall game? A goalkeeper who wants to play to their best of their ability will always be looking to improve. It is no good getting comfortable with dominating at a step level, if you really want to show how good you are, then you have to test yourself against better shooters! An easy example is the cream of the crop; the international level goalkeeper. Sure, they will be good and if playing at the top level are arguably great at what they do, but to be excellent, to be a cut above the rest and be the best in the world, they really have to push themselves to the limits to play to their best. The key to improvement is to constantly look to improve. The stated example required a lot of improvement to even get to the stage of being their country’s number one. They will have had to go through hoops and moved up levels at important stages in their playing career, where the jump between levels may have been considerable and required a lot of work. If you are a youngster looking to follow the same path, aside from the level of commitment needed, you will need to be looking to improve all the time. Once you get good at one standard of play it won’t be long until you push yourself to have a go at the next! This constant transition will require you to be pushing yourself to consistently give your all whilst looking to improve and refine your technique as you develop your goalkeeping abilities. Goalkeeper specific coaches (if you are lucky enough to have one at your club!) should obviously be able to help analyse your game from watching you train and help provide useful feedback, but even if you have access to such support, you should still be prepared to analyse your own game. By being self critical and analysing you will learn more about the game and in turn help develop as a goalkeeper. If you are without regular specific goalkeeper training to help you out, you are going to have to do a bit of independent learning (as they call it in schools these days!). Keeping a diary of the goals you were scored on, noting what caused them, where and how they were scored will help you learn from your mistakes and hopefully not make the same mistake twice. Similarly, you can use training to work out where you’re going wrong and how you’re getting beaten and then work to improve in these areas (such as getting your balance right during a save attempt, or getting your angles spot on to make the save). In the short term you can look to do better than you did in your last game, whilst over the long term of a season and more, you can try to be able to find overall improvement in your performances. In contrast, if you think you are good and have proven it, then think again! A good life tip I got taught by one of my lecturers when at university is to “never get comfortable”. If you’re sitting pretty admiring your good work, then the chances are you’re not going to be better than other goalkeepers who are you are going to compete for a spot for (such as county or national trials, or moving clubs and trying to take the starting spot, or stepping up a level) because you aren’t working as hard as you can. Whilst it’s essential to have self belief to play well as a goalkeeper, what I’m trying to get at is the need to do better than you’re already doing. It’s no good sitting on your laurels; you need to get out there and work on your technique so you can beat out the competition and be the unrivalled number one. A useful phrase that is used by ice hockey and football (soccer) goalies alike, is “you’re only as good as your last game”. This attitude makes you realise that no matter what league you play in or how good you are, your ability can only be analysed by your last performance. In essence, it will push you to improve, making sure you develop your ability to play well consistently. This way of thinking keeps you grounded and will help you analyse your performance, taking into consideration how well you played and the need to do as well or better in your next game. In my opinion, goalkeepers who do not look to continue their development will stagnate. In essence they will fail to reach their potential simply because they aren’t looking to do even better. Ok, so they are critically and analytically good (if taking high level goalkeepers as an example), but they can be even better. They (and you possibly!) are letting themselves down by not giving it your all and trying to do better than you are currently. Again, it’s all about the desire to play your best. If you want to be the best around, then you need to really be looking to improve at every given opportunity, even if you don’t think you need improving! Nobody’s totally perfect and there’s got to be something goalkeeping wise they can work on! Aside from the level of technique required for stepping up a level, even if you don’t wish to play at higher levels, you can still be looking to improve. At the end of the day if you love goalkeeping that much and love making saves, you can’t deny you want to play your best (even if you are playing for the sake of enjoyment) and working on improving means you have a greater chance of doing that. So, ultimately, it’s a win win situation: the more you improve the better you’ll get and the more saves you’ll make! Why it is important to look so sharp on the pitch is because I want to look sharp and professional in your guys goalie gear. I feel it’s important to look sharp on the pitch because when you look sharp you will therefore feel sharp and that is crucial in my overall game! Looking good on the pitch is important to me since it inspires confidence. If you are confident then you play better. I like to look sharp on the pitch because if you feel good you play well! Looking sharp on the pitch is important to me as it shows all the other players on my team that I am in the best kit on the market OBO!!!!!! Wearing OBO on the pitch also shows the other team that they have no chance of hurting me or putting a goal past me, clean sheets all the way. For spending good money on the best gear available it is REALLY important that it looks perfect all the time! I have lost the logo badge of my hi-control LHP. Without it I am letting in way too many goals as I just don’t have the look I need and the opposition seem to know it. I need that badge to up my confidence and get clean sheets again. Why is it important to look so sharp on the pitch?……I want to look sharp and professional in your guys goalie gear. Looking the part makes me look and feel like a boss, confidence is everything! It wouldn’t be called hockey if we didn’t look good! I am just joking but by looking good in OBO not only my teammates take me seriously but the opponents can too. Look great – Feel great – Play great………..that’s why it has to be OBO!! Looking sharp and wearing the best protection available (OBO of course) gives me the confidence to perform at my best. Can you send me a set of Hi Rebound replacement badges for my kickers and pads, without them I just don’t feel as sharp. My motto ‘look good, play good’. Looking sharp on the pitch is important, because so much of sport is about the psychology behind it. 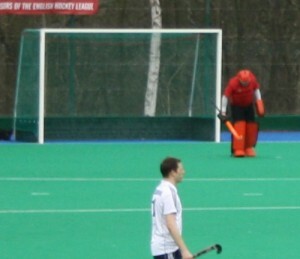 If you look good you feel good and feeling good adds to your confidence, also it is more intimidating for the opposition to see a keeper with sharp kit, they know you take your hockey seriously! I love to look great on the pitch!! and OBO helps me with this!! always making the best goalkeeping gear to the way I like it!!! I feel better more confident, and play better when I have got the best of OBO gear! I love colour, OBO just help me put my personality in to my goalkeeping inside and out!! I take great pride in my kit and appearance and I actually feel embarrassed playing without the badges! Not feeling completely perfect on the pitch sticks in my mind as a distraction! Looking good in goal is important to me because you can try your hardest to be the best, but if you don’t look it, you’re only half way there! Looking sharp on the pitch is important for me, because the goalkeeper is the face of the whole team, so one goal keeper can represent one team. Hence, we must look always sharp, clean and amazing on the pitch. When it seems that all is lost and the ball is goal bound and you’re surely going to concede, it can be easy to just simply give in and accept defeat. But that’s where you’re wrong! I’ve made plenty of saves desperately scrambling back to deny a goal scoring opportunity and due to the effort in recovering ground and not giving up on the play, have been able to stop a goal being scored. It can be quite an achievement, let alone lead to a great deal of satisfaction just to wipe the smile off the shooter’s face. Isn’t that what goalkeeping is all about?! Too many times have I watched highlights on Match of the Day with football (soccer) goalies simply watching the ball go past them, normally on free kicks (although arguably you could say you can’t be too critical as at that level the ball travels so fast they know they’ve been beat). Wouldn’t you rather give it your best shot (not sure if that can be considered a pun!) and see if you can stop it? 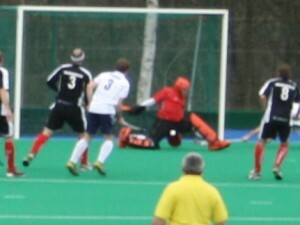 One way of dealing with such a scenario is to dive back on the play; diving back towards goal, trying to reach the shot. This is easier said than done, but if the ball is on the pitch and need lifted, then is obviously easier to pull off! Against a passing play you can cut the angle if the ball is headed towards you. That said if the ball looks like it’s about to cross the line but you have the time to stop it, diving back with your stick extended can stop it in its tracks. Although it’s a different sport altogether, you’ll find plenty of highlight reel saves by ice hockey goalies who reach back behind them to stop the puck crossing the line. Essentially you need to have a never give up attitude in order to stop yourself being beaten. Normally you expect to have to dive across or recover from an initial save where the ball has shot out (if the shot was difficult to control), if you are to make the stop. How you make the save is obviously dependent on the situation. If you’re out in the door leaving an “empty goal” for the shooter, then you’ll probably need to sprint across to get in its way, whilst if you are faced with an immediate follow up, you’ll need to do your best to recover into your ready stance quickly to make the next save. Similarly, if you have been beaten on a 1-on-1, then you can attempt to get back into your zone to get in the way of the shot, or run parallel to try and cut off the shooting lane. A good drill to practise this mentality is one I was taught a while ago dubbed “the killer” (because of how much it will wear you out!) which is apparently used by goalkeeper coaches in Holland. The drill starts off with three balls in a line, the goalkeeper runs out, slides to clear away the ball and then has to run back to try and stop a ball the coach has thrown towards goal. This process is repeated, testing the goalkeeper’s mental and physical strengths. It basically teaches you to never give up on the play, running back to try and stop the ball crossing the line. If you can do it in drills then surely you can pull it off in games! The following is a clip of South Korea’s goalkeeper Myung-Ho Lee making three concurrent saves in spectacular fashion in the 2009 men’s Champions Trophy tournament in Melbourne. He makes the initial save before recovering to make the second, before launching himself across the goal mouth to deny the Australians. With all that effort no wonder he ends up out of breath! And who says you can’t be unbeatable?! Ultimately, all it takes is a desire to stop every shot. Whilst it’s up to you and your confidence, you can try and make yourself unbeatable in games. Trying to stop everything thrown at you (or should that be fired or shot at you?!) and a desire to keep a big “0” or a clean sheet shows your team mates how much you want to win and should hopefully rub off them and inspire them. Remember, never say never! A ‘can do’ attitude is all it takes! Author Dan PilgrimPosted on July 1, 2012 July 2, 2012 Categories The Mental Game1 Comment on Never say never!